Posted on August 28, 2017	by Rachel L.
There are a host of different fall prevention training options, divided up by the type of workplace affected. Fall prevention is varied and essential. The danger of a slip, trip or fall is something that workplaces of all kinds must minimize – but the ways in which this occurs may differ heavily from one environment to the next. The risk factors that can lead workers into danger include everything from wet floors in break rooms to high catwalks on factory floors, and all must be safeguarded in line with OSHA regulations. Falls proved to be the second-most-common form of fatal occupational injury in the Bureau of Labor Statistics’ most recent data release, for 2015. Coming in behind only transportation incidents, falling accounted for 800 deaths. Most of the number involved someone falling from a high place to a lower level but a significant amount, 152 fatalities, resulted from other kinds of slipping, tripping or falling. Falls caused more deaths than harmful substances, equipment or violence in the workplace, and more than six times as many fatalities as fires and explosions combined. The hotel industry is a place where the customer experience is the product, essentially. A slip or fall by a guest could be seriously damaging to a hospitality brand’s image and reputation. It’s important to ensure employees become adept at recognizing and countering potential hazards to keep their customers safe – as well as themselves. Training is available on this subject, because it is a deceptively complex matter – there are dozens of tripping risk factors. Dealing with spills effectively, keeping trafficked areas clear and protecting trouble areas – such as transitions from floor to carpet – can keep a hotel safer. The training also involves incident response, because even the best preparation can’t prevent every slip or trip. It’s important for managers to take action before something goes wrong, but not always easy to remember. It’s often only when something goes wrong that fall prevention is really noticeable. In workplaces that commonly require employees to scale great heights, fall arrest harnesses may be required equipment. Of course, simply hooking workers up to these systems with no preparation isn’t truly helpful. 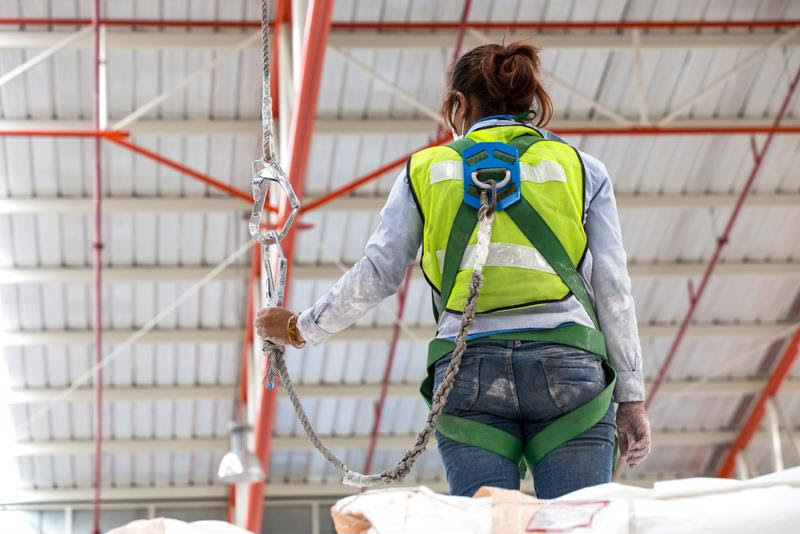 Safe and effective use of a safety harness means understanding what the equipment is designed to do, and how to effectively employ it in the high-pressure instance of a long fall. The specifics of using a harness involve picking anchor points that won’t give way and ensuring the snap hooks on the equipment are double locked. In addition to setting up and using these assets, inspecting them has its own best practices, also covered in the training. Just as with hospitality fall prevention, there are also important procedures to learn in case a problem does occur – it’s essential to know how to react, though ideally those skills will never be needed. Fall prevention equipment must be used correctly to be optimally effective. While preventing falls is important in workplaces of every kind, it’s especially relevant in construction. Working largely outdoors, on structures that are unfinished, construction workers are in high-risk environments relative to members of other professions, which means they need to have a specific set of protective equipment and training to get them ready for their duties. Courses prepare individuals for the tools and techniques that will keep them safe on the job site, as well as the practices they can employ in emergencies. Avoiding a fall involves realizing that risk comes from many places in construction work, not just the edges of high places. For instance, floors or other surfaces that haven’t been reinforced or aren’t intended to carry a person’s weight could break or fall away. Workers who are aware of their environments and familiar with safety tools can keep themselves safer than individuals without this information, and training provides this knowledge. It pays to remember that OSHA has unique rules and regulations on construction sites, further broken down by the kind of work being performed. There are training courses devoted specifically to ensuring practices and gear are up to the required standards. Getting such an overview is a great way to work toward compliance and overall safety. The risk of a slip, trip or fall is present in every workplace imaginable, and it’s therefore appropriate that there are many different courses promoting safety. These run the gamut from day-to-day office tips to courses aimed at construction workers who deal with perilous heights on a daily basis. Staying on guard against this common type of workplace accident is a valuable concept for leaders in all fields. This entry was posted in OSHA, Workplace Health and Safety and tagged fall protection, fall protection training, OSHA, OSHA training, safety, Safety Training. Bookmark the permalink.